I don’t think I’ve talked about it much here on Stu Station, but I was a big fan of the Gorillaz. Their song “Clint Eastwood” is one of those high school favorites I still enjoy today. The art style and musical arrangement and rap lyrics really hooked me, even to the point where I hunted the rapper down for some of his original material. I even picked up the remix and b-sides collections as they were released. The followup, Demon Days, quickly became one of my favorite albums the year it was released. However, I lost touch with Gorillaz later in their career. Plastic Beach felt empty and pointless to me, with maybe one decent song on it. I haven’t listened to The Fall yet, either, as I don’t think I could stand being disappointed again, plus the reviews weren’t overly favorable. Logging in to Spotify today at work, I noticed that they have a greatest hits CD that just came out and is available for streaming on Spotify, so I thought I’d listen along to it to see what I had missed. I think it’s a pretty good mix and representative of their entire career, with some clear hits and classic songs as well as a few more deeper cuts that I imagine played really well in live shows or radio commercials or some other context than active listening. “Rock the House” feels a little out of place, but since it features Del the funky Homosapian, the same rapper as on “Clint Eastwood”, that makes sense including it. I’d never heard “Superfast Jellyfish” before. Interesting song, may grow on me, same with “Doncamatic”. However, from Demon Days, I’d have included “Every Planet We Reach Is Dead” instead of “Kids with Guns”, and from their original release, I’d have included “5/4” and “Latin Simone” or “Left Hand Suzuki Record”, but both of those songs fit the album as opposed to a singles or greatest hits release. 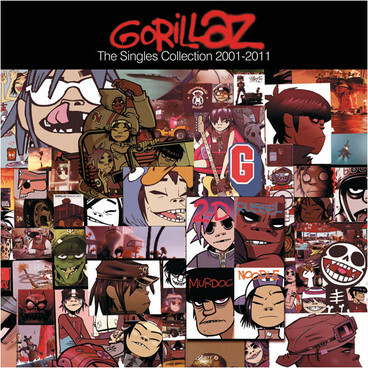 Still, this is the Gorillaz singles, and it’s a great compilation. Greatest singles collections of Great band. Forever.